Sheepskin is a natural pelt that features sueded leather on one side and soft, plush wool on the other. Lightweight and luxuriously supple, sheepskin is one of nature's greatest sources of insulation. Its soft wool fibers are naturally thermostatic, wicking away moisture for year-round comfort and breathability. Shearling is simply sheepskin with the wool shorn slightly to create a uniform look and feel. When cared for properly, a quality shearling sheepskin garment or home décor item can last a lifetime. Follow the simple cleaning and care rules detailed below to enjoy years of comfort and style. Questions? Please don't hesitate to contact us, no matter where you purchased your sheepskin product. We're open and happy to help 7 days a week via email, chat, or by calling (800) 683-7526. When treated with care, a high-quality sheepskin coat will provide years of enjoyment. Here are a few tips to help you maximize the longevity and beauty of your coat. To preserve the shape of your coat, use a large, curved hanger with broad ends when hanging, storing, or drying it. Always store your coat in a breathable garment bag made of cotton or woven fabric. Plastic dry-cleaning bags and PEVA or vinyl bags can cause discoloration and do not allow air to circulate, damaging the integrity of your coat. Be sure to hang your coat away from direct light sources of all kinds in order to avoid fading. While sheepskin can be worn in the rain or snow, it's best not to fully saturate it with moisture. If your coat gets wet, just shake off the excess water or snow, blot dry with a clean towel, and hang your coat to dry at room temperature, making sure to avoid any direct heat sources. Do not vigorously rub your sheepskin coat, as that will force the moisture deep into the leather, damaging the garment. After your coat is thoroughly dry, use a suede brush to brush the nap of your coat's exterior—unless it has a napa finish, in which case it's best to just rub the coat lightly with a soft towel. You can fluff the inside wool lightly with a wire brush. To clean up small spills on your sheepskin coat, use a damp cloth, and gently pluck any debris or dirt stains from the suede with tweezers. You can also use a scouring pad to lightly rejuvenate the suede and remove dirt marks at the same time. To treat liquid spots on your sheepskin coat from grease, drinks, etc., sprinkle a layer of corn starch directly onto the spot and let it sit for a day or two (the bigger the stain, the longer you should let the corn starch sit). When you're ready, dust off the corn starch and brush the nap of the suede with a suede brush. 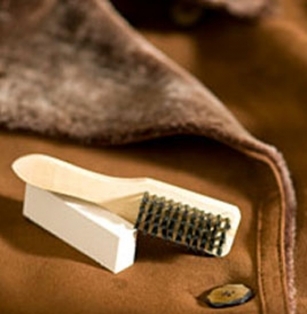 If your coat has a napa finish, do not use a suede brush; rather, rub lightly with a soft towel. We do not suggest having your sheepskin coat dry cleaned, as it can remove the garment's natural oils. In case of extreme soiling or stains, contact a leather and sheepskin specialty cleaner. We recommend Arrow Fabricare in Kansas City, MO, at (800) 542-7769. Cozy, cushiony, and moisture wicking, sheepskin slippers offer year-round comfort. Keep them looking and feeling fresh with these simple guidelines. Use a damp cloth to spot clean the outside of your sheepskin slippers, or use a suede brush to lightly rejuvenate the slippers' exterior. Sheepskin contains lanolin, a naturally antibacterial substance that keeps feet fresh. If your slippers start to develop mild natural odors from wear, you can refresh them by sprinkling baking soda in the slippers and letting them sit overnight. In the morning, vacuum the inside of the slippers. To remove stronger odors from your sheepskin slippers, you can put them in the freezer for 24 to 48 hours. Our impeccably crafted sheepskin rugs and pillows will lend beauty and plush comfort to your home for many years when properly cared for. Each type of sheepskin has its own unique attributes, so while the tips below apply to many of our rug styles, our Tibetan and Icelandic sheepskin rugs come packaged with specific care instructions to follow. The below instructions are only for Australian sheepskin items. To store your sheepskin rug or pillow, place it in a cool, airy place out of direct sunlight. We don't recommend storing sheepskin rugs in plastic bags for an extended period of time, as it doesn't allow the sheepskin fibers to breathe. When you receive your sheepskin rug or home item, don't worry if the wool appears flattened from the tight packaging—wool fibers are quite resilient and will bounce back to their original springy appearance in no time. A vigorous shake can also help restore the soft, fluffy appearance of the wool. Any fold marks from packaging will disappear once the item has been removed from the package for several days. We have two magic words for you when it comes to keeping your sheepskin rugs in clean, beautiful condition: spot clean! While you could machine wash your rug as a last resort, it can permanently alter your rug's texture, size, and color (not to mention larger rugs can damage your washing machine). Hand washing, while gentler, makes it difficult to remove enough water for the rug to dry properly. Proceed with care and caution if you choose to use one of these cleaning methods—and remember, spot cleaning is optimal. To machine clean, use a mild liquid household detergent in cold water. We recommend Eucalan™ or mild liquid hand soap. Do not use Woolite™, laundry detergents such as Tide™, soap containing enzymes or bleach, soap containing hand sanitizer, or products that are alkaline. Do not use fabric softeners. Rinse thoroughly in cool water. Hand squeeze as much water from the sheepskin as possible, then air dry away from any heat source and out of direct sunlight. Do not tumble dry in the dryer, as this can cause hardening of the suede. When your rug is dry, fluff the wool back to its full shape by brushing it thoroughly with a wire brush. Can I vacuum my sheepskin rug? Yes. Set your vacuum height to the highest setting or use the upholstery attachment to vacuum your rug. Can I take my rug to the dry cleaner? We don't recommend it, as the treatment removes the sheepskin's natural oils. For cases of extreme soiling or stains that spot cleaning can't fix, we suggest you contact a cleaner that specializes in leather and sheepskin. We recommend Arrow Fabricare in Kansas City, MO, at (800) 542-7769. My rug is matted; what can I do? To rejuvenate matted pile, we suggest brushing your sheepskin rug with a wire brush. Vacuuming the rug will also help fluff up the wool. Sheepskin seat covers make every ride an ultra-comfortable one. Temperature regulating and durable, our plush seat covers are easy to clean with these few steps. Regularly vacuum your sheepskin seat covers to remove dust and lint. If you spill something sticky or oily on the covers, quickly remove the excess and then spot clean the area with mild liquid hand soap. Let the covers dry naturally, out of direct sunlight. For a deeper cleaning, remove the covers, shake them out, and then place in the dryer on "air fluff" (no heat). Add some tennis balls or a clean sneaker or two to fluff up the covers during tumbling. Run for about 20 minutes, and clean the filter twice during this time to remove dust and lint particles. If your seat covers are identical and fit equally on both front seats, you may wish to switch the seat covers to rotate wear and sun exposure. For more information on sheepskin seat covers, see our Sheepskin Seat Covers FAQ and Sheepskin Seat Covers Info pages.